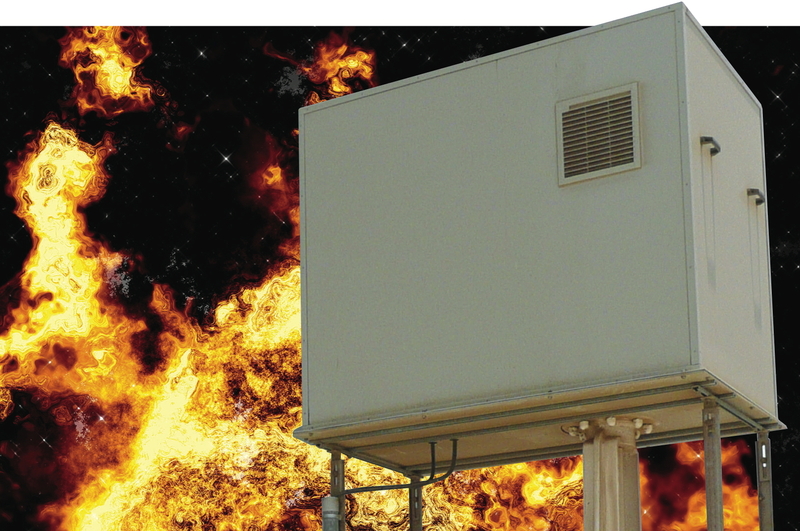 August 6, 2013 --- Outdoor enclosure specialist Intertec now offers an extensive range of fire-resistant shelters, including ‘1709’ models designed to protect critical safety equipment from exposure to high temperature fires in hazardous areas. The shelters are entirely passive, maintenance-free and impervious to a wide range of corrosive chemicals – including salt, sulphur dioxide and sour or acid gas. 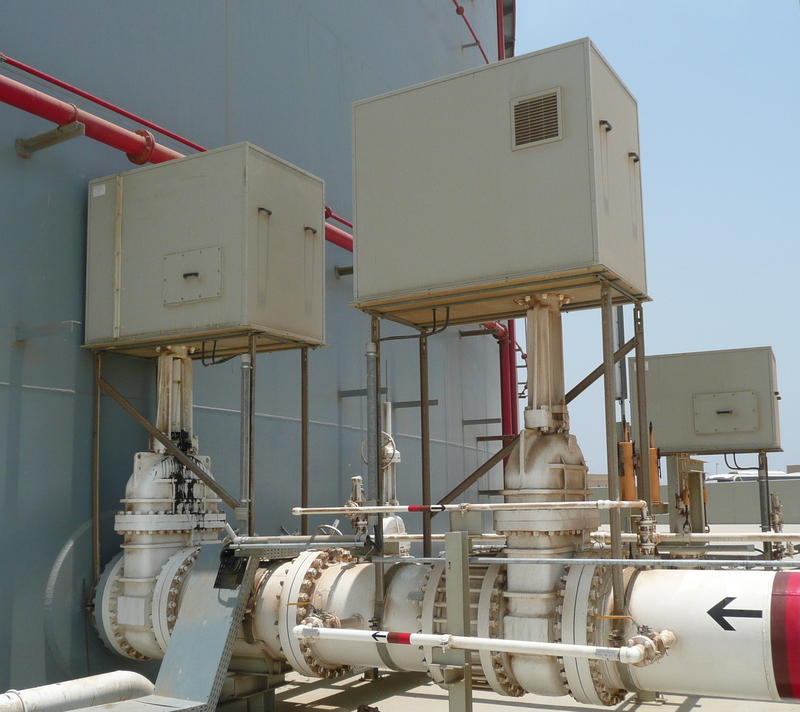 Typical applications for the 1709 versions include protecting valves and actuators in the emergency shutdown and fire fighting systems of refineries and chemical plants, and offshore oil and gas production platforms. Another key application for Intertec's fire protection materials is separating hazardous and non-hazardous areas on ships and on offshore drilling, processing and storage platforms. This development will be of considerable interest to designers seeking a means of meeting the future IEC 61892-7 standard for offshore platforms and vessels, which will demand area separation materials capable of withstanding a hydrocarbon fire for between 60 and 120 minutes. Intertec has extensive experience of fire resistant shelters, having produced models tested in accordance with the German DIN 4102-2 standard for 20 years. Throughout this period the company has continually improved materials and construction techniques to meet more challenging specifications, culminating in a new patented design that keeps contained equipment below 60 degrees C (140 F) for 90 minutes, even during ‘rapid rise’ hydrocarbon fires that can reach 1,093 degrees C (2,000 F) within five minutes. This level of protection is believed to be unique for passive fire shelters – many competitive models only specify 30 minutes of protection. "Our fire-resistant shelters provide significant technical advantages to process plant safety designers," says Intertec's Martin Hess. "They provide an extended safety margin of up to 120 minutes, but without the drawbacks of other fire-protection technologies such as metal cases, intumescent coatings, blankets and bags. They are rigid, so they can incorporate easy-open access points for maintenance, yet they are also exceptionally light and can be mounted directly on pipework." There are no specific international standards for fire shelters designed to keep contained equipment below 60 degrees C, so Intertec has defined rigorous test procedures. The company’s standard fire shelters are designed to withstand the type of fires that can occur in business and residential buildings, which are relatively slow burning; they typically take about 30 minutes to reach 800 degrees C (1,472 F), eventually reaching a maximum of 1,100 C (2,012 F) after about 3 hours. The shelters are tested against the standard nominal time-temperature curve that is defined in ISO 834 and used in many fire protection standards, and are available with ratings of 30, 60, 90 or 120 minutes. Intertec’s 1709 fire shelters are designed to withstand hydrocarbon fires with a ‘rapid-rise’ time-temperature curve. This curve is also used in the ANSI/UL 1709 standard for the protection of structural steel, which plant designers tend to use as reference because of the lack of alternatives. However, the permissible temperature for structural steel is 550 degrees C, because the metal retains its integrity up to this level. Intertec’s 1709 fire shelters, on the other hand, are designed to keep valves, actuators and electronics operational by preventing their temperature exceeding 60 degrees C throughout the protection period. The shelters’ design has been verified by an independent agency, which confirmed that its protection period exceeded 90 minutes, and that during this time the surface temperature of a sample electrical actuator in the shelter did not rise above 55 degrees C (131 F). Intertec fire shelters are constructed from a proprietary composite material comprising one or more layers of fire resistant mineral wool ‘sandwiched’ between sheets of advanced glass reinforced polyester (GRP). Depending on the model, the walls may consist of a single or double sandwich of this composite material. GRP has major advantages over metal, which is used in many conventional passive fire shelters. It has an excellent strength/weight ratio – GRP is almost as strong as stainless steel, but four times lighter – and is highly resistant to weathering and the corrosive effect of salt and other aggressive chemicals, as well as to most common petrochemicals. It is also an electrical insulator and has a much higher thermal resistance than metal, which makes it easy to avoid condensation. These attributes make the material ideal for the external and internal walls of fire shelters intended for long-term use in harsh environments, especially when weight is a consideration, such as offshore. The composite material used for Intertec’s 1709 fire shelters incorporates multiple layers of mineral wool and other fire resistant insulators, together with special fire retardant mineral coating. This material is the result of extensive development by the company and is specifically designed for graceful degradation, to ensure that cabinets and shelters maintain their mechanical integrity and thermal insulation properties for as long as possible in a fire. The inherent rigidity and low weight of the construction material makes it ideal for shelters that are designed to be directly supported by process pipes, or for larger enclosures intended to accommodate non fire-safe valves as well as their actuators. For maintenance purposes, shelters can incorporate removable panels – these facilitate much faster access than other common forms of fire protection which helps to minimise service time and costs. Intertec’s ‘1709’ fire shelters keep contained equipment below 60 degrees Celsius for 90 minutes in the event of a hydrocarbon fire. Intertec’s fire shelters can be mounted directly onto process pipework to protect field equipment such as valve actuators.